Will you be hitting the road for Thanksgiving or welcoming friends and family into your home? Regardless, you will probably be enjoying a truly epic meal. 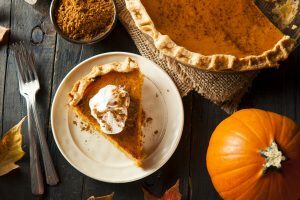 While we love the Thanksgiving spread as much as anyone else, we know that many of our holiday favorites promote tooth decay. Fortunately, our North Hollywood, CA, patients can take steps to protect their smiles. Brush Your Teeth: You should brush your teeth twice daily for two minutes each session. We also suggest using a toothpaste that contains fluoride. Routine care helps limit plaque buildup and remove food particles, reducing the risk of cavities. Floss After Your Meal: In order to thoroughly clean your teeth, you need to floss as well. Flossing between your teeth removes the food particles a toothbrush’s bristles cannot reach. You should floss before bed and also consider bringing a little with you to your dinner, excusing yourself after your meal and cleaning your teeth in the bathroom. Watch Out for Sugar and Starch: You’re probably aware that sugary foods (cakes, pies, cookies) increase the risk of tooth. But starch is also easily brown down by bacteria and can lead to a greater chance of cavities forming. Be sure to enjoy starchy foods, such as mashed potatoes, sweet potato casserole, cornbread, and biscuits in moderation. Drink Plenty of Water: If you drink water with your meal, you help rinse away food particles that could promote cavities. So, instead of choosing water or sweet eta, why not opt for water? We also want to remind you that if you drink wine, you should rinse with water and wait 30 minutes before brushing, as the acidic content of wine softens tooth enamel. Schedule a Cleaning: Consider scheduling a post-holiday cleaning, during which we will remove all plaque buildup! Do You Need to See Us? We can help you maintain a healthy smile throughout the holidays. For more information, schedule a consultation by calling Modern Smile in North Hollywood, CA, today at 818-763-9353. We also proudly serve patients who live in Burbank, Toluca Lake, and all surrounding communities.